This is Kate Colquhoun’s long awaited “next” book. It will be out in bookstores and available on line this Thursday October 16th. Long time readers here will remember her 2011 smash “Murder in the First Class Carriage”, an account of a true life crime which I compared to an Agatha Christie whodunit. Well, get ready to enjoy her latest release “Did She Kill Him”. This is the story of the case which has become known as the “Maybrick Mystery”. Although the action is set in Liverpool, the Maybrick Mystery was as widely celebrated (an odd term for a possible murder) at the time as the infamous Jack the Ripper case was in London. Both events occurred around the same time; in 1889. But there all similarity between the two ceases. Not only location, but social circumstances made the two episodes vastly different in nature; each with its own set of characters. The problem for Florence Maybrick was that the characters in her drama were so familiar to most people in Britain at the time, that it was easy for the public to conjure up a villain in her. Class and privilege; and the attendant gulf between the servants and the served; these were just part of the reason why Mrs. Maybrick was found guilty of killing her husband, James Maybrick; a well-known cotton trader from Liverpool; by slowly poisoning him with arsenic. Mr. Maybrick was about 20 years older than his American born wife; the two met while aboard a ship bound for Britain from America. Encouraged by Florence’s social climbing mother, the Baroness von Roques, the two are soon wed. They were both looking for financial security; he with a seemingly financially stable American; her with a seemingly successful merchant. They were both wrong in their assessment of the other. Florence was a slightly spoiled young woman; think along the lines of Scarlett O’Hara in “Gone with the Wind” and you wouldn’t be too far off target. She was a spendthrift and soon accumulated a good bit of debt which she kept hidden from her husband. He had life insurance which would have left her well off if he died. For his part he was not the well to do merchant he appeared to be. A failing crop in America and a bad investment in what amounted to today’s “futures” trading left him strapped for ready cash. And keeping up appearances with a large house and staff only drove him further behind financially. But appearances in Victorian England were important; important enough that to not keep them up could mean financial ruin in business. And, he was also addicted to eating arsenic. Arsenic eating dates back centuries. Ms. Colquhoun uses the Styrian peoples of what is present day Austria to illustrate the history of this odd; and deadly; practice. Introduced at a young age to arsenic the body will adapt to it; although with some discomfort; but then the problem really first begins. In order to not die from the arsenic already ingested, the user needs more and more to stay alive. To stop would be death. And yet, to continue will eventually do the same. The servants in the Maybrick home offer a window into the lower end of the social strata at a time when England; along with the rest of the world; was changing. Domestics, who used to have only one way to make a living, now had opportunities in factories, with jobs made available by the Industrial Revolution; and in trade, at jobs which had been previously been off limits to them by custom. Their loyalty towards their employers was not as solid as it had been in former times. The class system was crumbling. When James Maybrick took ill his doctors were baffled; yet in spite of knowing about his propensity to take various poisons they did nothing. As a matter of fact they gave him more in the form of the insidious concoctions they prescribed. In essence they were only making things worse. When Mr. Maybrick dies from his illness, a series of seemingly innocent actions on the part of Florence Maybrick become the basis for the theory that she killed him by poisoning him with arsenic. A bottle of medicine innocently moved from one place to another becomes just one of many apparent “clues” which were all missed until her husband had died and an explanation was needed. After all, it couldn’t have been the doctors fault. In this atmosphere a love note from Florence to another cotton trader; who was an acquaintance of her husband’s; becomes a log thrown on the fire as Florence finds herself the victim of circumstances that ultimately lead to her being sentenced to prison for her husband’s death. The only real evidence is circumstantial, and yet she is found guilty. But the real question brought forth by Ms. Colquhoun is this; what was really on trial here? An outmoded society in which respectable women were relegated to lives like Nora’s in Ibsen’s “A Doll’s House”? Or was it the “New Woman” which Florence may have represented to some? In the end all the medical evidence pointed against James Maybrick having even died from an overdose of arsenic; accidental or otherwise; in the first place. There simply was not enough arsenic in his body to explain his death. That is, unless someone withheld the drug from him. And even that explanation then leads to the question of whether that deprivation was done by design, or out of caution. A good mystery is one which can’t be solved. And in this book Ms. Colquhoun has presented us with a timeless parlor game; one which can be played for decades and never be truly solved. It is extensively annotated with a Bibliography and chapter by chapter notes on the sources. There is also a very helpful list of People that serves as a cast of characters. In short, this book was all I expected it to be and more. 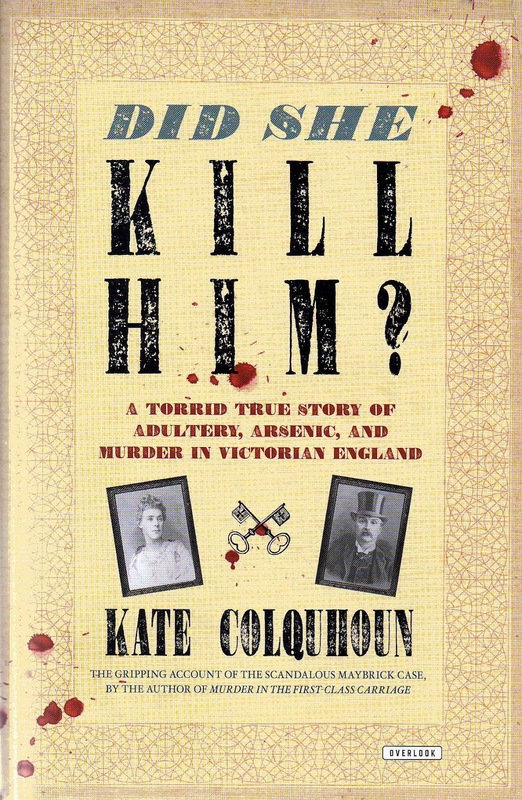 And, with her steady style and keen sense of history, Ms. Colquhoun has done a superb job of both chronicling the Maybrick Case; keeping the mystery alive for future generations; while also addressing the social inequities which may have played a part in the whole sordid affair. This is the mark of a truly gifted writer.